Health at Every Size and the Fat Acceptance Movement started as small, barely recognised movements. Due to the hard work of those involved and the (very) gradual shift in views around weight, shape, and size, these movements are now beginning to get the acknowledgement and publicity that they deserve. The more exposure these movements get, the more people will start to be enlightened to the real facts, figures, and evidence around size, health, and weight set point theory. Hopefully with time weight-based myths, discrimination, and stigma will be something that we as a society look back on and cringe with shock and humiliation that we got something so wrong and treated millions of people so badly. However, we still have a really long way to go until then. You might be new to these movements, or you might not be, but either way, you may be unsure about what they stand for and why these things are so important. So let’s have a look at each movement and discuss a little bit about them. 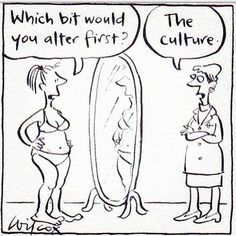 Health At Every Size (or HAES) was first developed by American psychotherapist and nutritionist Linda Bacon, who wrote the book Health at Every Size (first published in 2008), and the sequel, Body Respect. Health At Every Size is a movement that is promoted by those who believe that health and fitness can be achieved regardless of weight, shape, and size, and that weight-loss is not a requirement for those deemed “overweight” or “obese” by BMI in order to live a healthy and happy life. HAES encourages people to accept their weight as it is, and promotes mental and physical well-being without weight loss as a goal. HAES cites studies that have shown that weight loss often leads to worse health regardless of the starting weight, and presents evidence that suggests that obesity is not the cause of health issues or premature mortality. It provides strong arguments for the idea that correlation does not equal causation, and picks apart flaws in studies that apparently connect obesity to poor health. HAES supports self love, self care, and body positivity, as well as healthy physical lifestyle choices such as being active and eating a balanced diet. 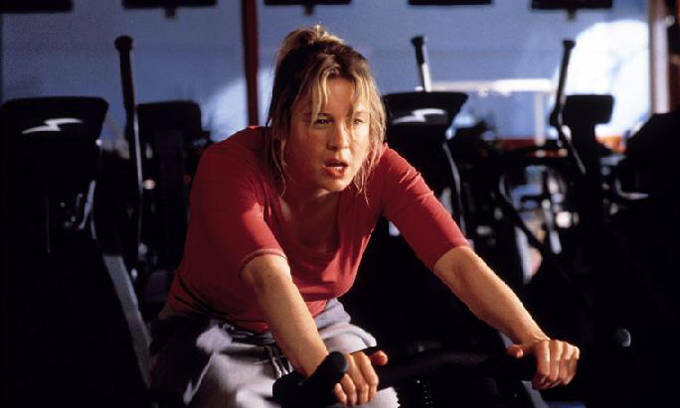 HAES promotes this in a way that is conductive to mental health: it urges people to engage in activity that is enjoyable first and foremost, and not gruelling and repetitive work-out routines, and it supports the idea that food is not just for survival but also for pleasure. It maintains that weight loss should never be a goal, and that weight loss is frequently damaging, and encourages people to follow intuitive and instinctive eating and activity. It also supports weight set point theory. Health At Every Size is a movement that I strongly agree with. Its main principles on exercise, food, weight, and body positivity are ones that I advocate with every fibre of my being. It’s incredibly important because we live in a culture obsessed with dieting and weight loss; a culture preoccupied with attaining the “perfect body – a body that is not achievable for the majority of people without sacrificing their mental and/or physical health. Even if you are someone who naturally has society’s idea of the “perfect” body, the dieting and weight loss industry will find ways to make you feel inadequate and flaw-ridden in a bid for you to buy their products to “fix” yourself with. The diet and weight loss industry controls much of our research into food and weight, and sweeps any evidence that contradicts their interests under the rug and publicises in a selective and biased way research that has questionable study methods or sample sizes, contentious results, and tenuous correlations. So do I have any criticism of the HAES movement? Firstly, I think that although HAES is absolutely correct in that we should intuitively eat and listen to hunger and fullness cues, it underestimates how difficult that can be to relearn, especially if you are someone who has suffered with an eating disorder or severe dieting. In our society, feelings of guilt, self-loathing, shame, anxiety, and, on the other hand, superiority and control, have become inextricably linked with food and weight, and so it can be incredibly difficult (and perhaps even impossible) to entirely disentangle our emotions from our biological signals. That’s not to say that it cannot be done, but we need to address the context in which we live in our bodies before we can start to challenge and relearn the way that we feed and view our bodies. Being presented with the principles of the Health At Every Size movement can feel like ordering flat-pack furniture and taking it home, only to open it up, lay out the pieces of the floor, and realise that the instructions aren’t there. You’re left with all the parts, but with no idea how to assemble it. And in reality that’s not exactly a flaw of the HAES movement itself, as HAES aims to educate and promote a mentally and physically healthy and positive way of living, but it is an area it sometimes fails to recognise and address. Secondly, I’m not really a fan of the name. Heath At Every Size is misleading. Although I absolutely 110% agree that the what we view as “healthy” should be a much much much broader range of weights, it is undeniable that there are certain weights at which you just cannot be healthy at. You cannot be a healthy adult at 50lbs, just like you cannot be a healthy adult at 500lbs, and so the name of the movement leaves it open to criticism from the onset. Prader-Willi syndrome, hypothyroidism, cancer, depression, anxiety, or eating disorders are a few examples which can cause a person’s weight to plummet or skyrocket, and there are weights that are too low or too high for anyone to be healthy at. So for me, I believe in Health At (Pretty Much) Every Size, and whilst Health At Every Size is much more catchy, it’s technically incorrect, allowing those against the movement an easy starting point on which to discredit it. Last but not least, HAES aims to provide people with the information to start working towards accepting their bodies whatever their weight, shape, and size in order to improve both physical and mental health. However, it also has to be addressed that we live in a society where fat people are constantly subjected to prejudice, body-shaming, weight stigma, and discrimination. Fat people who agree with HAES may still struggle to accept their body size in a culture so cruel to them, and their inability to find peace with their bodies may well become yet another source of shame. Again, this isn’t a flaw in the principles of HAES, but a topic that may need more recognition. The Fat Acceptance movement (also known as the size acceptance, fat liberation, fat activism, fativism, or fat power movement) is a social movement seeking to change anti-fat bias in social attitudes. Those involved seek to change attitudes towards fat people in areas of life including the aesthetic, legal, and medical approaches to people whose bodies are fatter than the social norm. The Fat Acceptance movement focuses more on the way fat people are perceived and judged due to their weight, shape, or size, and although it does address physical health and the research to back up the same principles as the Health At Every Size movement, it is more focused around changing the way fat people are treated and discriminated against. Fat people are often dehumanised and shown far less respect than those that are at a socially “acceptable” weight. One of the main examples is medical care. Fat people’s medical issues are often inaccurately dismissed as being caused by their weight, are shown less respect, and are often shamed for their body size. The Big Is Beautiful movement is a smaller movement that comes under the Fat Acceptance movement, and focuses more on aesthetics. Its message is that people whose bodies are bigger than what is considered socially “acceptable” are beautiful too, and that you don’t have to be a certain weight, shape, or size to be attractive. Its aim is to help people find beauty in their bodies regardless of any contributing factors that make them look a certain way: health is besides the point. Both movements are focused around respect, and also talk about health as irrelevant. The ideas is that even if you believe that someone IS unhealthy due to their weight, its not your business what lifestyle choices they make, and they should be treated with respect regardless of those choices. For example, we all know people who smoke or binge drink, but we do not treat them as less human on an everyday basis because those choices lead to poor health. We do not assume their personality, or directly link their personal lifestyle choices with their moral character. This is why these movements are so important: they address the way society perceives and treats people who are fat. My only criticism of these two movements (Fat Acceptance and Big Is Beautiful) is that there are some people involved in this movement who look down on those who diet as betrayers of the movement, when they should be seen as victims of a diet and weight loss obsessed society. As I stated above with HAES, it can be forgotten how powerful and pervasive “thin ideals” are, and all of us are affected by it in some way, even if we do constantly work to disentangle ourselves from it and rise above it. We should all be working together to support one another and help to lift each other up not put anyone down. We should aim to educate, not shun; support, not vilify. Health At Every Size, the Fat Acceptance movement, and Big Is Beautiful, are all extremely important in terms of physical health, mental health, feminism, and education around food, weight, and health, amongst other things. They are powerful and uplifting; inspiring and motivational; enlightening and passionate. They can give us the information and confidence to live in a better way; a way that makes the aspirations of health and happiness more achievable. To find out more about weight set point theory, and to read discussions around and evidence to support Health At Every Size, you can visit the resources section on this website. There is a drop-down menu that displays many sub-sections, including one for each of these topics. This entry was posted in body positivity, eating disorder recovery, feminism, healthcare industry, Uncategorized and tagged anorexia, anorexia athletica, anorexia athletica recovery, anorexia recovery, ARFID, ARFID recovery, big is beautiful, big is beautiful movement, body, body positivity, body positivity movement, bulimia, bulimia recovery, diet and weight loss industry, diet industry, eating disorders recovery, ED recovery, EDNOS, EDNOS recovery, fat acceptance, fat acceptance movement, feminism, HAES, health, health at every size, healthy lifestyle, lifestyle, media, orthorexia, orthorexia recovery, OSFED, OSFED recovery, recovery, society, weight bias, weight discrimination, weight loss industry, weight stigma on November 1, 2016 by Sarah Frances Young. Why Do We Find it So Hard to Accept that Our Weight is Not as Within Our Control as We’d Like to Think? Most of us have grown up in countries preoccupied with weight. We have grown up being told that it is down to us what size we end up at, that we have control over what weight we are, and that it’s about having willpower and making the “right” choices about what we put in our mouths. We’ve been told to count calories, exercise at the gym, resist cake, fill up on fruit and veggies, and even to curb hunger with glasses of water. We’ve been told to ignore hunger, wage war on our bodies, and to trust the information given to us by the media and the weightloss and dieting industry. Even our doctors have gotten on board with the “healthy is only for the slim” message, regardless of evidence to the contrary. But recently, health at every size and weight set point theory are finally starting to become recognised as fact. Information about our bodies having varying, individual, healthy weights that the body will attempt to stay at regardless of what you eat is at last wedging itself into the media. Information about the fact that you can be fat and be healthy is now getting noticed, rather than being swept under the rug and buried by the pharmaceutical and weight loss industries that benefit hugely from the majority of the population trying to alter the way that their bodies look. But even though this evidence is coming to light, people still seem to be having a hard time accepting it. By people, I mean healthcare officials and others who get to make the big decisions about what information is given as guidelines for health. By people, I also mean the public. Even though the evidence showing those who are in the “overweight” BMI category are living longer than any other BMI category (yes, including the “normal” category) was so overwhelming that it was published in the Journal of the American Medical Association, people are still trying to find reasons to why this could be other than it actually just being the obvious: that it’s healthy to be “overweight”, and that “overweight” is not overweight: that we have to accept this as reality, like we would with any other comprehensive scientific study. Even the medical community keep trying to bury their heads in the sand and subtly hide or erase the information that the (many) studies have given us. Other studies show that you can be any shape, weight, or size, and be healthy (this becomes less likely with the very morbidly obese and the underweight, but that is not to say that there are not those in both categories that are healthy), and many, many studies show that food and weight is not as correlated as we have been told it is (for more information on weight set point theory go to “Weight Set Point Theory!” under my links section). In fact, it probably doesn’t play much of a part at all, unless you are starving yourself so that your body cannot maintain its weight because of the lack of energy, or you are stuffing yourself to the point of nausea every time you eat so your body cannot cope with the excess energy. The latter is not a common occurrence, except for those with binge eating disorder (which is far less common than you think it is, but that’s a conversation for another time), whereas, unfortunately, the former is – because of the influence the dieting and weight loss industry has had on us, and the prevalence of restrictive eating disorders. The body actually has it’s own system for regulating body weight when you are listening and responding to it properly, not ignoring hunger, and following cues from the body to eat whatever it wants, whenever it wants. If you are in touch with your body and can eat an amount comfortably within your day, then you’re not eating too much, and your body can regulate the energy it is being given so that you still maintain within your healthy weight range that is individual for your body. So why, even with all the hard facts and evidence, it is so hard for us to accept that a) you can be fat and healthy and b) if you want to be healthy, you have to let your weight be what it is supposed to be naturally? It’s something that I’ve had to think about, because this is a topic close to my heart and one that helped my recovery from atypical anorexia, and because I’ve come across people on the internet and in my life that have point blank refused to even look at the research showing them that the misinformation that has been drilled into us from our fatphobic, thin-obsessed diet culture isn’t actually reality. It’s frustrating, and it’s sad. I am lucky that most of my friends are at ease around food, and – even though they have their own insecurities about the way that they look – accept their bodies as they are. However, I have a few friends that include those who go on and off diets, desperate to find a way to feel better about their bodies, those who flit between diets and disordered behaviour whilst loathing the skin they live in, and those who battle eating disorders (and before I end up validating the myth that diet culture is a common cause of eating disorders, it’s not, but it sure as hell makes recovering all the more difficult). It’s these people that I feel so sad for, and all the billions of others that are at war with their bodies, that don’t know about – or can’t accept – the fact that their natural, healthy weight is not under their control. And I feel sad for all those who are naturally in the overweight or obese BMI ranges, whose natural, healthy weights are where there bodies are at, but are constantly shamed and abused for those bodies that they are in. And I feel sad for those who have spent their life yo-yo dieting, only to see their weight go up and up and not understand why (side note: it’s because your metabolism slows down during the diet because your body is being starved, and then it stores energy as fat when you go off the diet and so you subsequently gain weight, so you end up back on a diet again, and the cycle continues, rather than letting your body heal and settle back at its natural, healthy weight range). And I feel angry at those who remain wilfully ignorant and keep judging and condemning those who are overweight or obese. But back to the question: why is it that we find it so hard to accept that maybe body diversity is great, and that people can be healthy at any weight, shape, or size, and that we can’t dictate what our weight is if we want to be healthy and happy? The first, most obvious reason to me is that we have had misinformation drilled into us for so long. We have grown up being told fat is bad and that we are responsible for saying no to so many of the foods we want to eat, responsible for exercising frequently, and responsible for maintaining a slim body. To then hear such opposing information means that our world turns upside down. Food and weight are such integral parts of our culture and society that to have what we think we know turned on its head is disturbing. It’s confusing. It’s shocking. It means we have to rethink everything about that topic. For some people, that’s just too much, so they refuse to believe it: they reject the new knowledge outright. People don’t like change. It’s scary and it makes people feel uneasy and unstable. It also means that if you accept that we are being lied to, then it makes it hard to know what information to trust, and that makes life a hell of a lot harder. For some people, making choices about food and maintaining a certain weight through those choices are a form of control. People generally like to be in control. And even though we associate food and control being two parts of an equation that results in an eating disorder, those without eating disorders often engage in what is called “disordered eating”, and that can most definitely include feelings of control. Disordered eating is not a mental illness, but it’s an unhealthy relationship with food (and most probably involves body image issues too). It’s also really, really common because of how obsessed our society has made us with food, and because our diet culture literally encourages it. To be someone who uses food and weight maintenance as a way of feeling in control, and then finding out that you don’t need to have that control and actually to not be controlling about food and weight is the best way to be healthy, is an anxiety-provoking experience. So they reject it. People also don’t like to have laboured under false hope. Those who feel unsatisfied with their bodies (and who doesn’t after our bodies have been attacked and shamed and ridiculed by the media and the dieting and weight loss industry in order to get us to buy their products) and who have gone on to diet, don’t want to know that their efforts are in vain and that they will not maintain any weight loss, that they will probably end up gaining more weight than the weight they originally lost, and that their dieting and subsequent weight loss and weight fluctuations can actually create health issues including higher risk of developing diseases, and a higher mortality rate. People who feel unhappy in their bodies don’t want to hear that they actually can’t make those changes to their bodies, especially if they want to be healthy. They don’t want to know that they are stuck with the body that they have, even though it has been shown over and over that changing your body doesn’t make you any happier (and again, changing your body isn’t sustainable). To actually learn to accept your body as it is can – sadly – seem like a much bigger challenge than changing it. In addition, there’s a darker reason why people don’t want to accept the changing of the tides where food and weight is concerned: people who make what are considered “healthy” choices about diet and exercise feel morally superior. This makes me feel highly, highly uncomfortable, and it should make you feel the same. What people eat or don’t eat is not a reflection of who they are as a person. It doesn’t make someone a better person if they eat whole foods and abstain from any kind of “junk” food. It doesn’t make someone a worse person if they enjoy burgers and fries. Eating “healthy” doesn’t mean that they have more willpower than someone who chooses to eat “junk” foods. It doesn’t make anyone more superior than anyone else. It doesn’t mean that they are making better life choices. It doesn’t even mean that they are doing the best thing for their body and souls. It doesn’t mean anything except that they are making different choices to someone else. That’s it. That’s all it means. 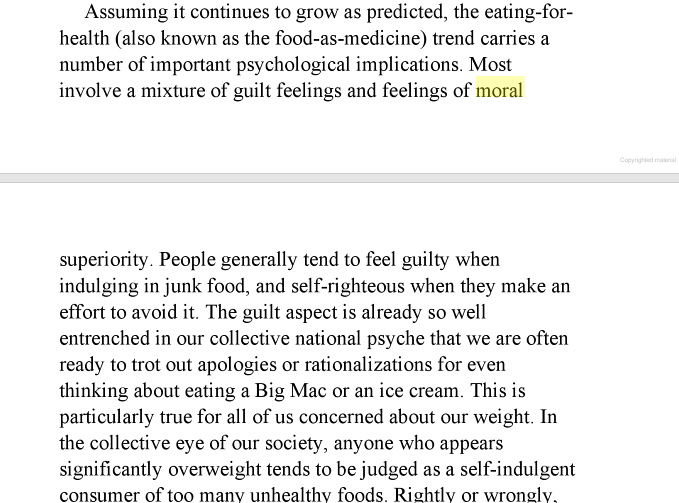 But somehow, it has become ingrained in us that we are morally superior if we make “healthier” choices. And yes, I chose to put that word in quotation marks because I don’t believe that you are necessarily healthier if you only eat “healthy” foods. I also believe that distinguishing “healthy” and “unhealthy” perpetuates a negative relationship with food because it then leads to “good” and “bad”, and there we are, back to morality, guilt, and shame again. Accepting information that affects us in so many different ways is a really, really tough thing to do. Food and weight is inextricably linked with feelings of superiority and willpower, shame and guilt, with privilege, abuse, money, hatred, insecurity, laziness, greed, power, and sexuality – if not much more. To look at it all anew and recognise how much of it is wrong, and the devastating affect it has had on so many people takes time and patience. It also takes acceptance that those providing us with our health information don’t have our best interests at heart, and that can make some people feel embarrassed for having such blind faith in such a corrupt system. So I get it. I get that it’s not something that people can just accept at a moment’s notice. But on the other hand you can’t bury your head in the sand and protest blindly against that which is proven fact, however much others try to muddy the water and cloud your judgement. Think for yourself. Educate yourself. Whatever conclusion you come to, make sure you’ve got the information and the knowledge. Don’t just blindly accept whatever you are told as the truth. That is all I ask, for your sake, and the sake of those affected by our obsession with food and thinness…for the sake of everyone. Take control by educating yourself, making the right choices for your physical and mental health, and taking steps towards making peace with your body, as it is. This entry was posted in diet culture, health, Mental health, society and tagged body, body hatred, body image, control, diet culture, diet industry, dieting, disordered eating, eating disorders, fatphobia, fatphobic, HAES, health, health at every size, healthy lifestyle, mental health, mental wellbeing, mental wellness, obesity, pharmaceutical industry, recovery, society, weight, weight loss, weight set point, weight set point theory on November 14, 2015 by Sarah Frances Young.